First, the top-30 grossing movies are consistently longer than the top-100. That’s super interesting, but we should not rush to the conclusion that longer equals more successful. 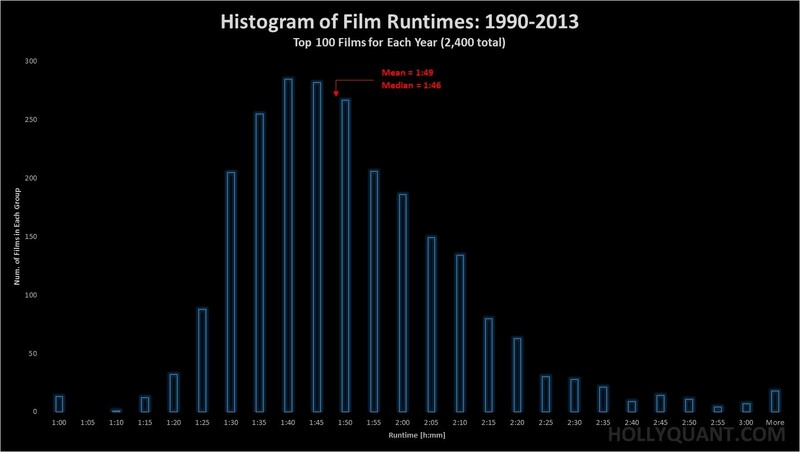 The correlation between runtime and domestic gross is actually very low for the top-100 (r-squared < 0.1) – a fairly odd result, which may imply that these blockbusters are unnecessarily long. 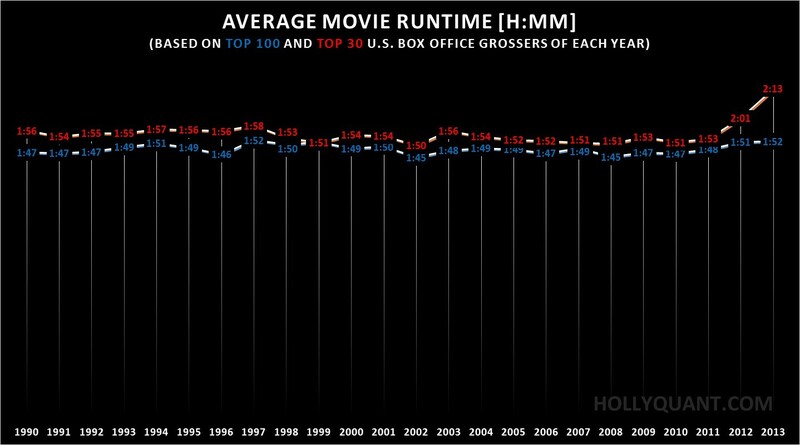 Second, for 22 years – between 1990 and 2011 – movies’ runtimes were pretty much steady (less than 6% fluctuations) for both the top-100 and the top-30. But then in 2012 and 2013 – the top-30 shot up by about 15%, while the top-100 remained steady. Is this the beginning of a trend? We’ll have to wait a couple of years to see about that. We see that this is not a pure bell-shaped Gaussian distribution: it is skewed to the right (the average is beyond the peak). This means that when films get longer – they can get really long. But in any case, one thing is true: if you are like most Americans and primarily pay for tickets for the top-30 biggest blockbusters – you are not wrong if you feel these films are getting longer. But if you mix smaller films into your cinematic portfolio, that is not the case. So why are blockbusters getting longer? Perhaps the producers want to justify the ticket price by providing the viewer with a long evening of cinematic entertainment – maybe even too long. Or perhaps the huge upfront costs of setting up a blockbuster production make the marginal cost of an extra 30 minutes of film negligible? Or perhaps it’s the competition from premium television’s longer and more complex story arcs? * All the raw runtime data is from boxofficemojo.com (100 films for each year; 2,400 films total. Yes – a Python script did that).